Joseph Abekah, Associate Dean, External, and Professor of Accounting joined the Faculty of Business Administration in 1991 and is a member of the Accounting/MIS area. He teaches Administration, Managerial Accounting, and Intermediate Accounting in the BBA program and Introductory Accounting and Managerial Accounting in the MBA program. He received the UNBF MBA Society's Professor Recognition Award in 2001. 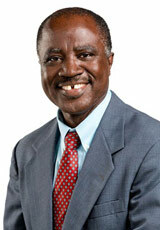 Dr. Abekah was appointed to the position of Associate Dean, External, in July 2011. He is responsible for the oversight and coordination of the Faculty's educational offerings in Egypt, Trinidad and Tobago, and Ukraine. His mandate includes staffing and maintenance of the academic standards of those programs, as well as ensurng that the programs are conducted in accordance with the Faculty's policies. He also supervises student exchange relationships with other universities. His academic interest areas are financial and managerial accounting, securities markets, and the effects of accounting regulations. His articles have appeared in the Journal of the Academy of Business Administration, the Journal of African Finance and Economic Development, the Journal of Comparative International Management, and the Journal of Financial Management Analysis. Learning Styles and Business Learning Objects. Twenty-Ninth STLHE Annual Conference, Fredericton, New Brunswick, 2009. Z Score Busters: Evidence from the Toronto Stock Exchange. Conference on Trends in Global Business, New Haven, Connecticut, 2008. Computer Simulations for Applying Business Concepts. Kaleidoscope, Fredericton, New Brunswick, 2007. Direct Investment and Economic Growth of Selected African and South American Countries. Alfred K. Eccles, ed. Miami, Florida: International Trade and Finance Association, 2007. Foreign Investment and Economic Growth of Africa. Atlantic Economic Journal, December (2007), 117-118.